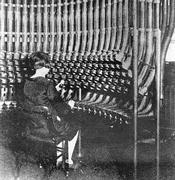 Old-style pneumatic tube system used in business. Alfred Ely Beach's experimental pneumatic elevated subway, 1867 (top) and a cross-section of a car from his completed subway (left). Tim Howgego's excellent Capsule Pipelines. Transportation Futuristics: Pneumatic transportation, a historical image exhibit from the University of California. Scanned version of the 1868 monograph The Pneumatic Dispatch... by Alfred Ely Beach, with illustations. 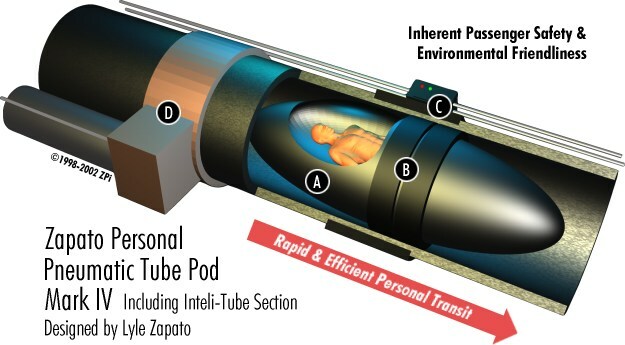 Innovative Transportation Technologies has information on, and links to, many alternative forms of transportation, including pneumatic tube systems. Beach Pneumatic - "Alfred Beach's Pneumatic Subway and the beginnings of rapid transit in New York" by Joseph Brennan.